The BAC precision resistor series from Isabellenhütte includes a PCB with connector for voltage sensing, designed for battery management systems or welding equipment with a low resistance value of 0.0001Ω. The BAC series from Isabellenhütte is available with tinned or untinned terminals, continuous load up to 320A (0.0001Ω) within a chip size of 8420. The BAS precision resistor series from Isabellenhütte, designed for battery management systems or welding equipment with a low resistance values from 0.000035Ω to 0.0005Ω. The BAS series from Isabellenhütte is available with tinned or untinned terminals, continuous load up to 350A (100µΩ) within a chip size of 8420. The BKW 4-terminal precision resistor series from Isabellenhütte, designed for energy meters with resistance values from 0.0003Ω to 0.0005Ω. The BKW series from Isabellenhütte has extremely good long-term stability, thus the energy meters do not require any recalibration, very high reproducibility of R-value and TCR. The BVD 2-terminal precision resistor series from Isabellenhütte are designed for energy metering and battery charging, with a resistance value of 0.0005Ω (further values available on request). The BVD series from Isabellenhütte is available with heavy cooper connectors, continuous current load up to 75A. The BVM-F precision resistor series from Isabellenhütte are designed for high current applications such as kWh meters and battery chargers, with a resistance value range from 0.0001Ω to 0.0005Ω. The BVM-F series from Isabellenhütte has a three different power connections threaded bolts, bolt down holes and solid terminals which has a continuous current load up to 200A (0.0001Ω). The KVM precision resistor series from Isabellenhütte are designed for battery management systems and battery chargers, with a resistance value of 0.0001Ω. The KVM series from Isabellenhütte has heavy copper connections with a continuous current load up to 250A. The RUG-Z high precision shunt resistor series from Isabellenhütte offers 4-terminal connection technology of very high precision current sensing shunts with a maximum power rating of 250W on a suitable heat sink. Designed for measuring high currents with very high accuracy in power supplies such as those for superconducting magnets. The RUG-Z series from Isabellenhütte has a single pulse power load of 50J (tp <10ms) capabilities. The RSA series of precision current shunts from Riedon have been especially designed for DC ammeters and similar instruments. These base-mounted shunts offer current ratings from 5A up to 150A with outputs of 0.05V, 0.1V or custom options available. They utilise a Manganin® resistive element and have a standard tolerance of ±0.25% with ±0.1% parts available on request. 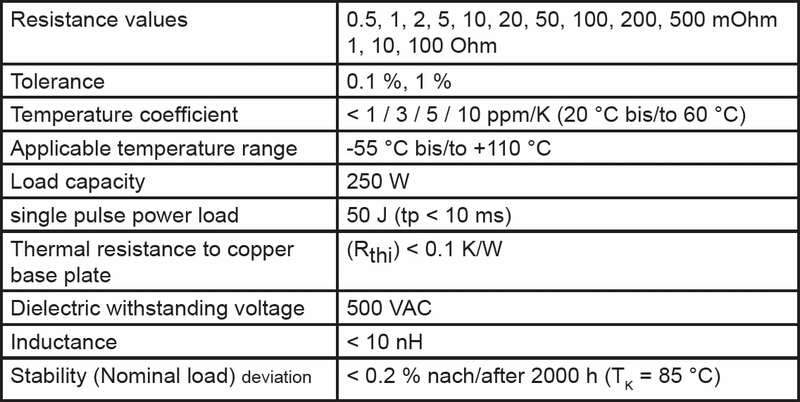 The very low resistance values required for the shunt resistors, which range from 333.3µΩ at 150A to 0.01Ω at 5A, are provided by the Manganin® resistive elements. These RSA precision shunt resistors are also UL listed and feature a 4-terminal design, separating the heavy duty load carrying connections from the voltage sensing terminals. The RSB series of precision current shunts from Riedon have been especially designed for DC ammeters and similar instruments. These base-mounted shunts offer current ratings from 170A up to 600A with outputs of 0.05V, 0.1V or custom options available. They utilise a Manganin® resistive element and have a standard tolerance of ±0.25% with ±0.1% parts available on request. 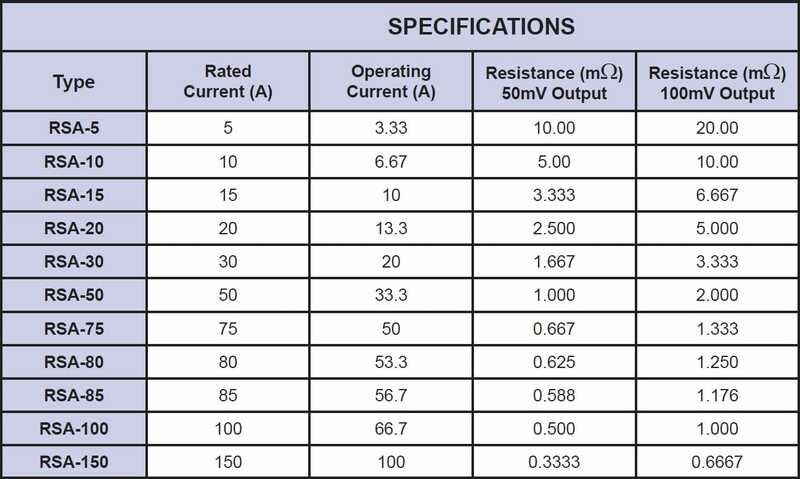 The very low resistance values required for the shunt resistors, which range from 83.3µΩ at 600A to 588.2µΩ at 170A, are provided by the Manganin® resistive elements. 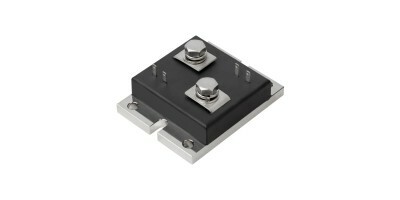 The RSB precision shunt resistors are also UL listed and feature a 4-terminal design, separating the heavy duty load carrying connections from the voltage sensing terminals. The RSC series of precision current shunts from Riedon have been especially designed for DC ammeters and similar instruments. These base-mounted shunts offer current ratings of 800A, 1000A and 1200A with outputs of 0.05V, 0.1V or custom options available. They utilise a Manganin® resistive element and have a standard tolerance of ±0.25% with ±0.1% parts available on request. 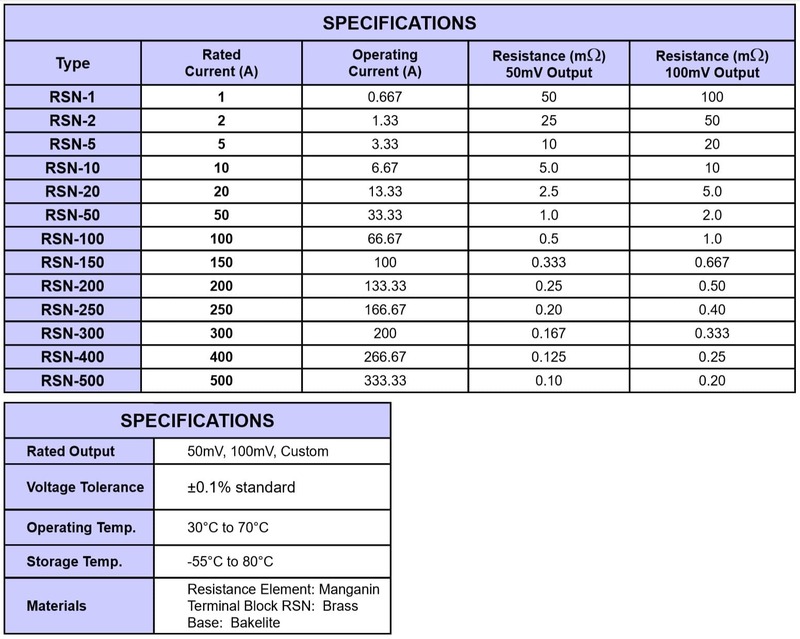 The very low resistance values required for the shunt resistors, which range from 41.7µΩ at 1200A to 125µΩ at 800A, are provided by the Manganin® resistive elements. The RSC precision shunt resistors are also UL listed and feature a 4-terminal design, separating the heavy duty load carrying connections from the voltage sensing terminals.